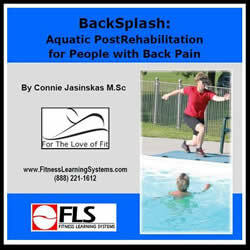 Discuss aquatic applications for back rehabilitation, common causes of back pain, and back injury issues. Identify 3 common steps to reduce back pain and the 3 phases of recovery and care for a back pain client. Discuss the 6 recommendations for back pain recovery and three characteristics/benefits of vertical aquatic exercise for low back pain. Discuss core training strategies for a back pain client including progression, what to avoid, and potential limitations. Describe 3 key elements and 7 exercises for teaching abdominal bracing and core stabilization in the aquatic environment. Identify equipment and methods that can be used for training the core and back in the aquatic environment. Explain how to safely and effectively perform 7 aquatic core exercises with variations.